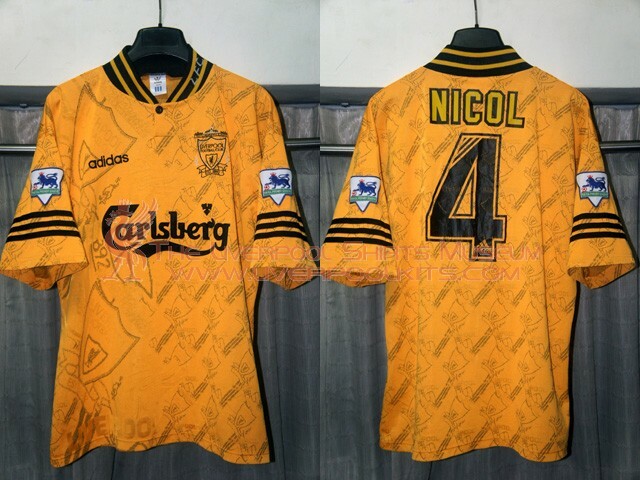 This third shirt was used by Liverpool in three consecutive seasons: 1993-1994, 1994-1995 and 1995-1996. 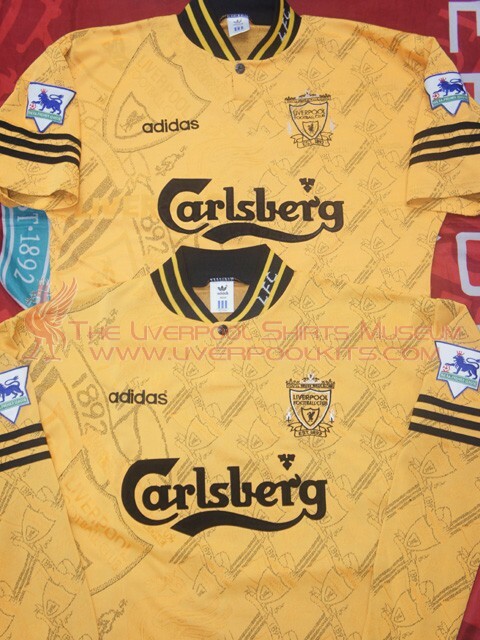 This third shirt is also the only one with big-Carlsberg replicas produced. The version shown here is from the 1993-1994 season. 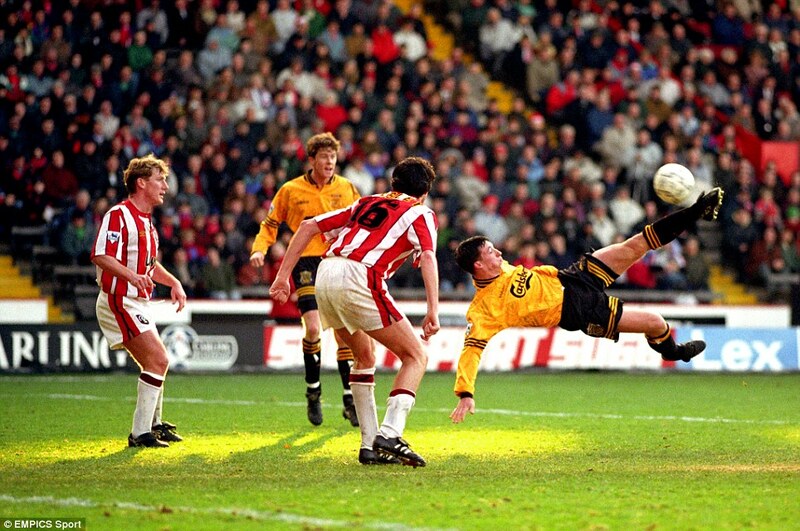 Featured Steve McManaman and Robbie Fowler wearing the 1993-1994 third player shirt in the Premier League away match against Sheffield United, played on 26 December 1993 at Bramall Lane. 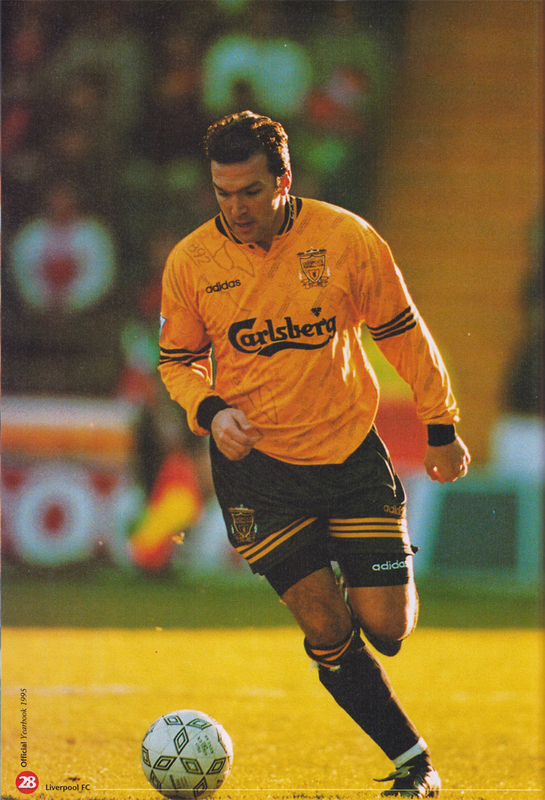 Featured Neil Ruddock wearing the 1993-1994 third player shirt in the Premier League away match against Sheffield United, played on 26 December 1993 at Bramall Lane. 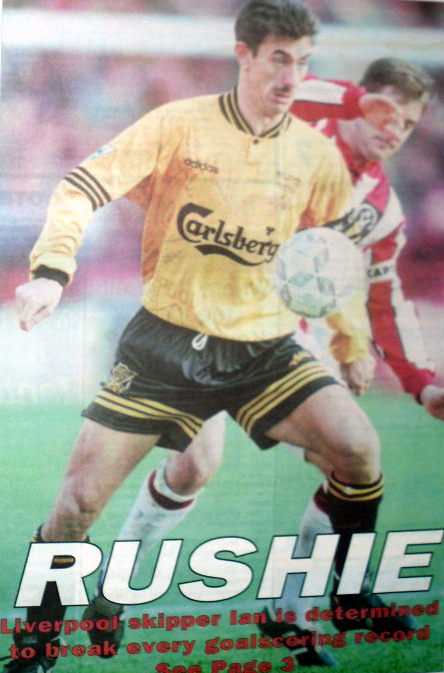 Featured Ian Rush wearing the 1993-1994 third player shirt in the Premier League away match against Sheffield United, played on 26 December 1993 at Bramall Lane. 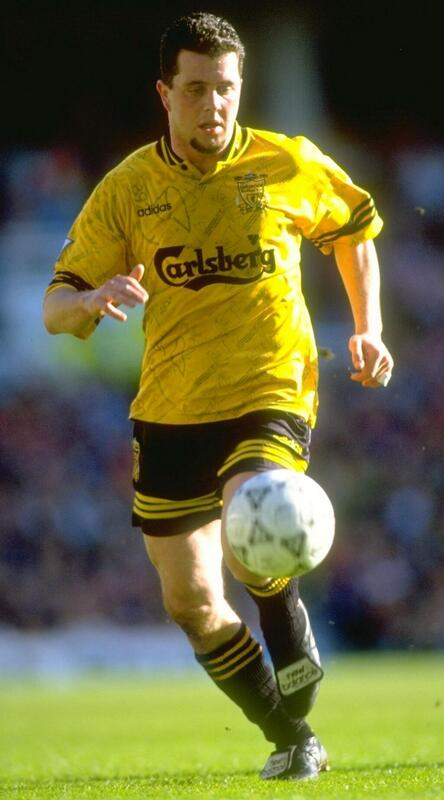 Featured Julian Dicks wearing the 1993-1994 third player shirt in the Premier League away match against Sheffield United, played on 26 December 1993 at Bramall Lane. So what's the significance of curator's ever repeating of Bramall Lane match on 1993 Boxing Day? Let's focus on the Liverpool club crest - can you spot the white flame torches stitched? The flame torches' color is not nothing special. Any collector who possess a 1994-1996 third shirt may pick it out for a look. Left: Standard replica shirt has BLACK color flame torches stitched in bold threads. Middle: Standard player shirt from 1994-1995 and 1995-1996 has BLACK color flame torches stitched in thin threads. Right: WHITE color flame torches are stitched ONLY on the shirts worn in the season 1993-1994. An apple to apple line-up comparison between "white flame torches" player shirt and a standard player shirt. Apart from having white flame torches, the 1993-1994 third shirt has other distinctive features. 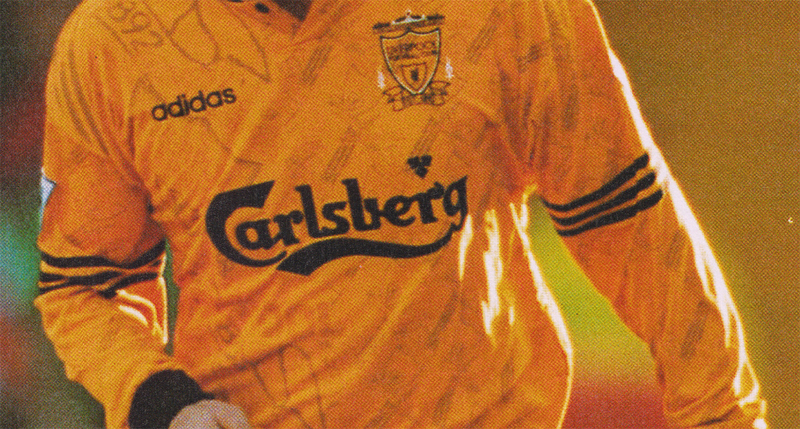 Top: The 1993-1994 player shirt's fabric is incorporated with "LIVERPOOL" word watermarks. 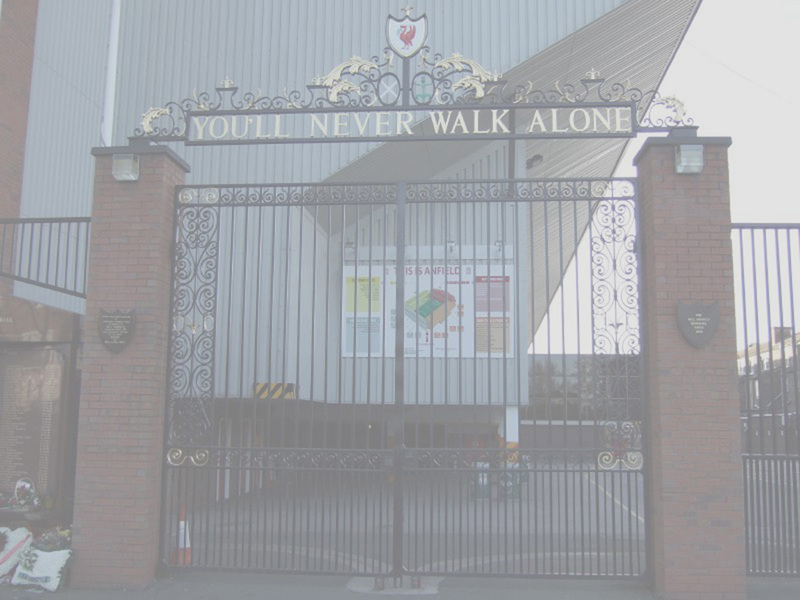 The midpoint of the Liverpool crest aligns with the trifolium of the Carlsberg sponsor beneath it. There is no register logo (circled-R mark) stitched next to the alphabet "s" of "adidas". 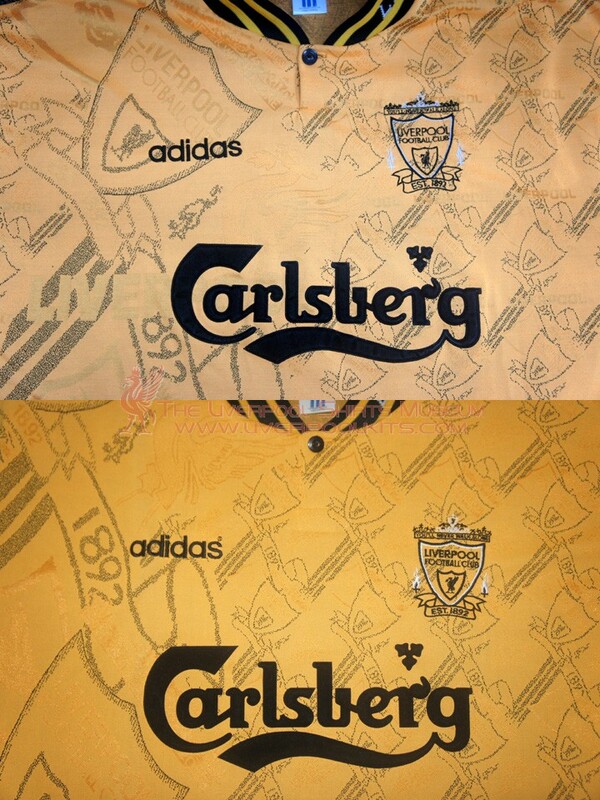 Bottom: The 1994-1996 player shirt's fabric has no "LIVERPOOL" watermarks incorporated on the fabric. The midpoint of the Liverpool crest aligns with alphabet "g" of the Carlsberg sponsor beneath it. There is also a register logo (circled-R mark) stitched next to the alphabet "s" of "adidas". Another basic season's differentation of the third shirt is by reference to name & numbers used on reverse. Top: Shirts from season 1993-1994 have PU number with Adidas Equipment logo. 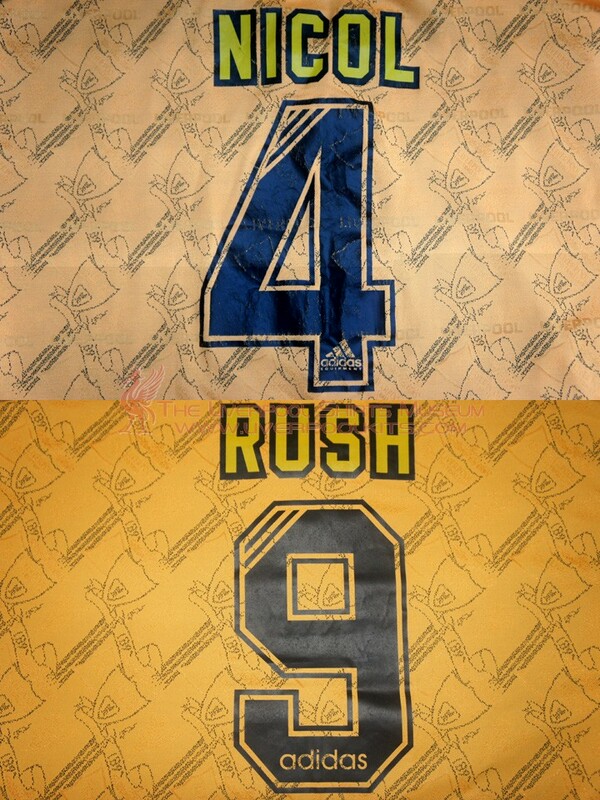 Bottom: Shirts from season 1994-1995 and 1995-1996 have PU number with Adidas logo. 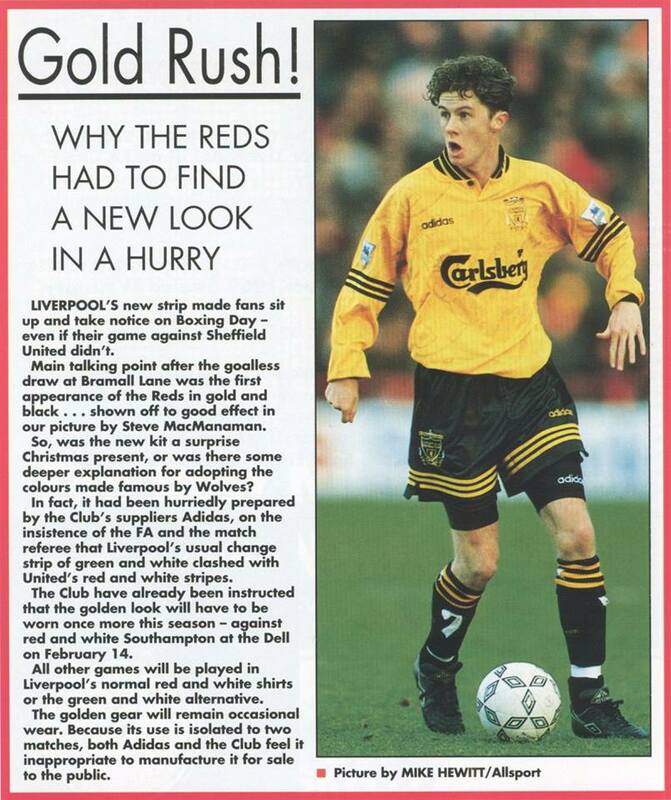 Here's a page extracted from Liverpool's home match programme against Manchester City on 22 January 1994. It mentioned the third shirt was debuted on 26 December 1993 Boxing Day match against Sheffield United due to kit color clash, but the club had no intention to produce it for retail purpose.